Ostional is a small remote town that appeals to those who want to "get away from it all". 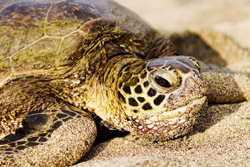 Known mostly for the Ostional National Wildlife Refuge created in 1984 and protects one of the world's most important nesting sites for the Olive ridley turtles. The refuge extends 15 km along the 200 meter wide shoreline only 200-meters and extends into the Pacific Ocean for three miles. It includes the beaches of Ostional, Nosara and Guiones. At certain places the refuge extends inland along the estuaries of the rivers and mangrove swamps to protect large bird colonies. The main attraction—the Olive ridley sea turtles that lay their eggs on this protected black volcanic sand beach. The nesting season is August through November and you can for a nominal fee you can get a guide (required) to watch the turtles lay their eggs.